Astrophotographer Greg Diesel Walck sent in a photo of the crescent moon at sunrise taken on May 8, 2013. He writes: "Finally clear skies after days of going out at 4 am to see the rising moon. This is the last view before the new moon and the orange skies were amazing.Unedited picture at 5:15 am, Currituck Sound, coastal North Carolina." "The first sub-group of three would be your INTIMATES. These are the most directly experienced of all Support Positions. They are LOVE, KNOWLEDGE, and COMPASSION. Next, we will cover the INSPIRATIONALS. These Positions are labeled MENTOR, BEAUTY, and CHILD. Finally, you have your SPIRIT GUIDES. We do not mean this term in the typical definition, but rather in the respect of their impact on more Spiritual (or abstract) Lessons as opposed to your day-to-day Material Lessons, as you will see. These Positions tend to hold more clues to themes that carry over several lifetimes. These Positions are especially free to be played by anything, or anyone, physical or non-physical, incarnated or not, who exemplify and express the inherent quality. They are HEALER, ENLIGHTENMENT, and MUSE." it is one that I love, I feel this story may help people to see that which they need to see. I see just that little bit more that needs to be said or expressed. So here you have the fable told to me by the wind. and your emotions will lead you to your destiny. There was an enchanted island and on that island there lived a tribe of feelings. so he commanded that everyone make a boat to save themselves. So everybody made their own boats…except Love…she wanted to stay with the island until its final moments. they both said as they stood next to her, doing nothing, but looking at the waves. can I get on your ship? so go forget you and I hope you die!” and Anger just left her there to die. and so he passed her by. to take Frustration and Despair with him. They both shouted, take us with you! The stranger looked at both of them and told them to answer a question. “What do you have to offer us where we are going? simply start a process to change your choices !!! " sayinghello wrote: You may not realize it, but your wisdom is slowly going viral via Facebook. I had to stop in to thank you for sharing your wisdom acquired in a rare view of life (for most of us). I wish you well and wanted to offer my thanks. Any chance you live near me? I wish I had spent more time living and less time working." Those words stuck with me, and it's been 28 years. I was actually pregnant when she told me that. And I've spent more time living and less time working. we don't live to work. Those words from a woman I love had an enormous impact on my life. Thank you, Aunt Freda, for the gift of your wisdom. I still miss you. Sometimes I wonder if being "unhappy and unfulfilled"
throughout one's life is genetic. and never expressed her feelings, hopes or wishes. for any last words or goodbyes. without so much as a whimper on the way out. Perhaps she didn't fear dying. and content, all of which are arguably worthwhile qualities. is the pain I have caused others." which again is fear of losing a certain status in life. Etc. etc. - we will be able to live a life with A LOT less regrets. "Never let your fear decide your fate"
I got surprised when I reviewed all five regrets . All regrets were related to worldly desire. Nobody regretted that they did not progress spiritually. and have ever lasting bliss and peace? With spiritual practice we can experience Bliss in this life and in after life . because the very purpose of our life is achieved. when they've seemed to veer off the path of what truly matters in their lives. what do they wish they would've done? caring for those who were dying. She eventually published a book called the The Top Five Regrets of the Dying. if they give us insight into what we can change today for the better. that follow toward an even more fulfilling life. when we notice the star, we can always come back to it. about how we should or shouldn't act. and even what kind of profession we should be in is common. what seems right to you and live an authentic life? on their deathbeds for missing a day of work. and sometimes as an addictive behavior to avoid discomfort. and pay attention to things that nourish us more? and we stay silent out of fear. can help us feel more connected, self-reliant and happy. At the crux of feeling happy and fulfilled in life is having nurturing relationships. and of course face to face. an integral part of your day to day life? until the end of life that happiness is a choice. about what nourishes us and what depletes us. What beliefs we want to invest in and which ones we don't. and this may help us ride them with more grace. into your life starting today. Your interaction creates a living wisdom for us all to benefit from. He said, 'You know, I'm kind of 50/50 on believing in God. 'Maybe that's just wishful thinking. "Steve’s final words, hours earlier, were monosyllables, repeated three times". and then over their shoulders past them. At 58 I have watch many friends and relatives leave this earth. Fortunately, most of them had strong faith and showed my how to leave this world with grace. Living life with grace enables one to leave this earth with grace. I want to be remembered with a smile. I spend my time trying to make others smile. Sharing smiles is free and should be done with reckless abandon. The day before my mother passed away, the Minister told her, he loved her attitude. Her response was, "ya gotta live life with a smile" and she did. The smile on her face, showed her gladness in her heart. Her life was enriched with family and friends, not money. My parents did not leave me with the wealth of money. They left me with wealth of heart. Something money can not buy. The daughter replied, "Mom, our life together has been more than enough. Your love is all I ever needed. I wish you enough, too, Mom." They kissed and the daughter left. "Did you ever say good-bye to someone knowing it would be forever?" "Yes, I have," I replied. "Forgive me for asking but why is this a forever good-bye?" "I am old and she lives so far away. I have challenges ahead and the reality is the next trip back will be for my funeral," she said. When you were saying good-bye, I heard you say, "I wish you enough." She began to smile. "That's a wish that has been handed down from other generations. She paused a moment and looked up as if trying to remember it in detail and she smiled even more. We all live through monads...which ones are you living through ? can help you to navigate where you may be in the Love Monad. What are you exploring ? whilst transmitting short electrical pulses. which are ‘extracted’ from the surface of the object. and it has been quite well studied with physical electronic methods. generating electronic avalanches on the surface of the dielectric (glass). This process is called ‘sliding gas discharge’. and this glow is what is being measured by the EPC method. whilst intensifying this emission in the gas discharge, owing to the electric field created. 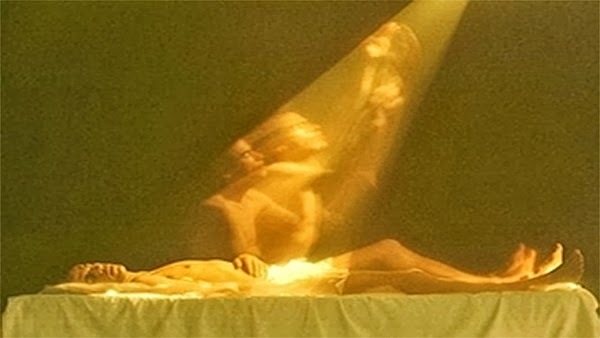 who photographed a person at the moment of his death with a bioelectrographic camera. shows in blue the life force of the person leaving the body gradually. where the spirit before surfing the phantasmagoria of the infinite. and return to the body in the days following death. This could be due to a surplus of unused energy.